On October 31, 2016, Standing Rock tipped. The protest that began in small fashion earlier last year, became a national movement as thousands across the country checked in at the Standing Rock reservation as a sign of solidarity. For me, it was truly the first large-scale, nonviolent demonstration I had chosen to involve myself with. I grew up Mennonite and ended up at a Christian university, but Standing Rock took my faith from church to everyday life. In the seven months following the first prayer vigil we hosted at Eastern Mennonite University (EMU), my life has taken some unforeseen turns in my walk with Jesus. Yet growing up Mennonite made me aware of the tension in the church with involving ourselves in these types of demonstrations. There have been those who push the separation of church and state to the extreme, where this activism is seen as “being of the world.” And then there are those who see this work as caring out God’s love for us by loving creation and the oppressed. But in supporting Standing Rock and then joining The Lancaster Stand, a Pennsylvania group opposing the Atlantic Sunrise Pipeline, I have begun to see the destination of my journey – a place where environmental justice must intersect with my faith. Jesus says, “You shall love your neighbor as yourself” (Mark 12:31). This simple verse is repeated often in Sunday School and Bible studies, but why does it feel like many Christians (including myself) are no longer practicing it today? It is time we start talking about the implications of this verse, especially in relation to the “Doctrine of Discovery.” Our ancestors descended upon the new world and colonized it under the guise that they were bringing Christianity to new parts of the world. Yet we forget that we massacred an entire group of people, the indigenous tribes of this continent. To this day, this doctrine has forced an entire group of people into a life of poverty and destruction. As a Christian, I am called to work and keep the land, to preserve it for generations to come. It is what sustains my environmental justice efforts, so that when I move on from this world it is in better shape than when I found it. This is what Standing Rock was about: protecting the oppressed and protecting creation. Standing Rock opened my eyes, helping me and others to begin the long road of recovery to help right the wrongs we have committed against indigenous people and to support them as they fight fossil fuel infrastructure. They have given us a clear example of what intentional, loving community – the kind Jesus wants with us and other believers – looks like. It is why I have turned my attention to The Lancaster Stand, as they fight the same battle as Standing Rock did. 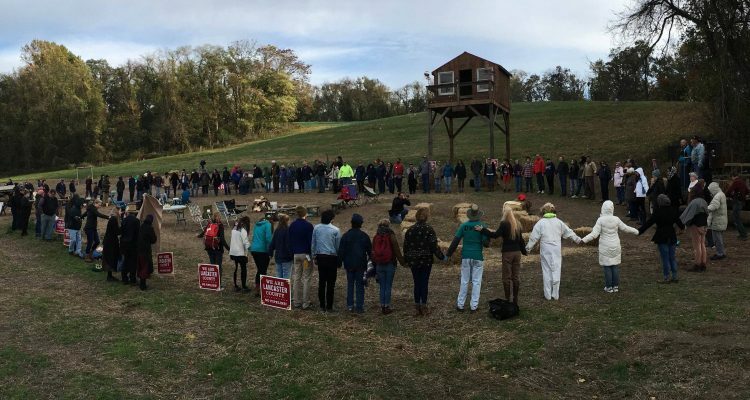 For three years now, the people of Lancaster have fought the Atlantic Sunrise Pipeline, as its construction would destroy countless native artifacts and graves. 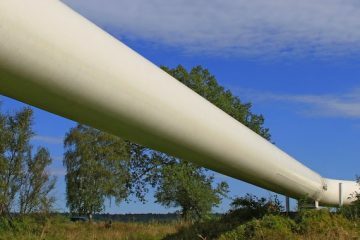 If the pipeline breaks, it would pollute local streams, rivers, and watersheds, as well as contaminate Mennonite, Amish, and other farmland. It rings eerily similar to Standing Rock. Now, more than ever, Martin Niemöller’s poem “First They Came” rings true in my life. 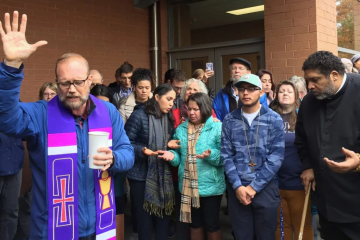 First they came for indigenous communities, then they came for the impoverished neighborhoods of Flint, Mich., and now they are coming for peaceful Mennonites. Fortunately, there are still thousands of people willing to stand up against environmental injustice. Begin talking about these issues. As stewards of the Earth, we must raise awareness for the environmental injustices we commit. Learn more about the Lancaster Stand and sign on to the public statement that our coalition released at EMU. Divest money from the banks that are financing the destruction of our Earth and the oppression of indigenous people. Live simply and in direct contrast with the actions of fossil fuel companies to show another way of living that puts people, peace, and planet first. But all of this would be remiss if we forget one of the simplest and most powerful things we can do: pray. Standing Rock and other social movements have shown myself and countless others the power of prayer. While prayer does not guarantee a better tomorrow, it reminds us that what we do, who we influence, and what we change is not because of us, but because of God. From Standing Rock to The Lancaster Stand, these movements can show the world what it looks like when Christians actively follow Jesus’ words. So we at EMU, in conjunction with other Christian universities across the U.S., ask you to stand with our oppressed brothers and sisters and to support The Lancaster Stand. We urge you to discern how environmental justice is one of most pressing issues of our generation and must be dealt with, no matter how difficult the conversation. And we will join you in this difficult yet life-changing journey of showing the world what Jesus’ love looks like in action. Austin Sachs is president of the Coalition for Climate Justice at Eastern Mennonite University in Harrisonburg, VA.